President George W. Bush and former President George H.W. Bush greet crewmembers of the aircraft carrier USS George H.W. 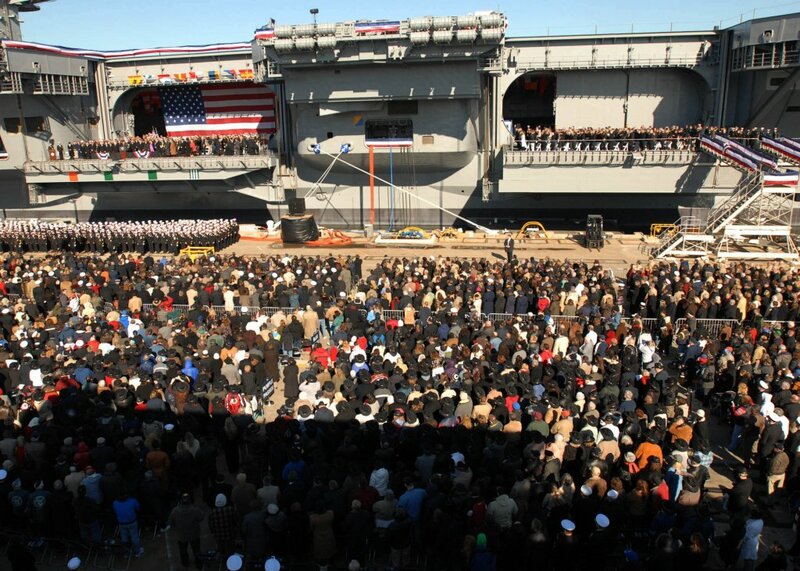 Bush (CVN-77) at Naval Station Norfolk, Va. during the ship's commissioning ceremony. U.S. Navy photo by Mass Communication Specialist 1st Class Demetrius Patton (#090110-N-5735P-034). Master Chief Jon Port, Command Master Chief of USS George H.W. 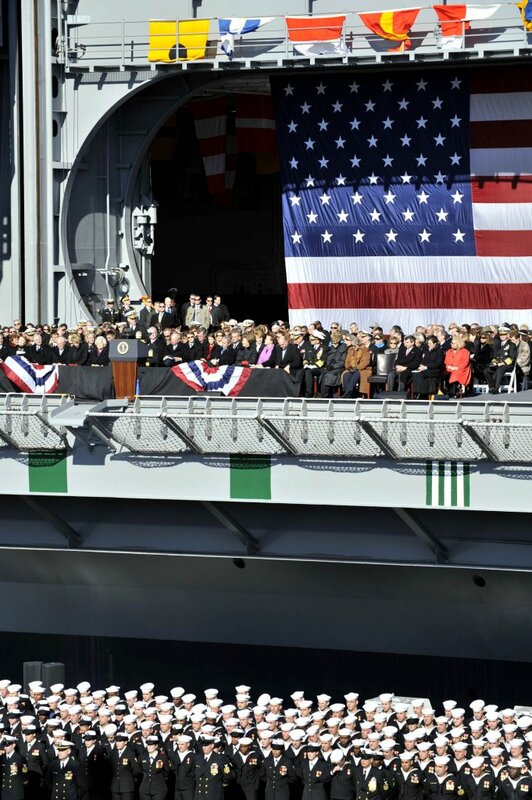 Bush (CVN-77), escorts Dorothy Bush Koch, ship's sponsor for the aircraft carrier, to the speaker's platform during the ship's commissioning ceremony. Koch is the daughter of former President George H.W. Bush and the sister of President George W. Bush. U.S. Navy photo by Mass Communication Specialist 1st Class Demetrius Patton (# 090110-N-5735P-062). Former U.S. President George H.W. 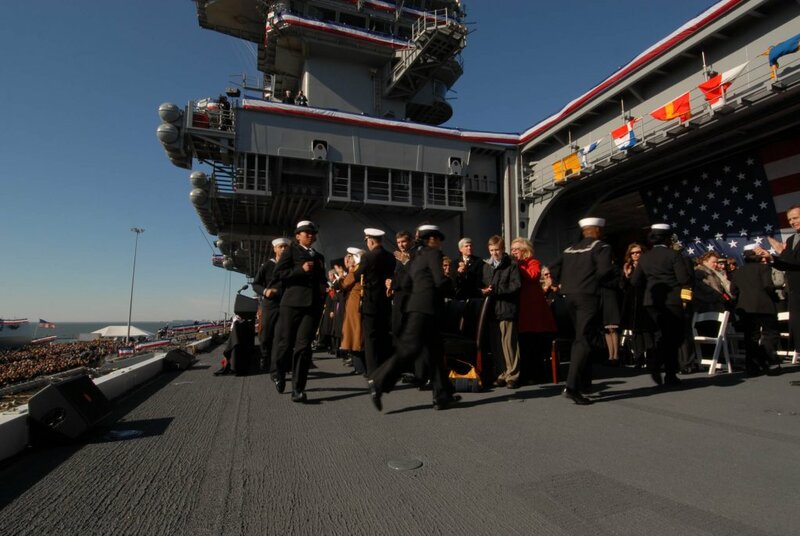 Bush is escorted aboard the aircraft carrier USS George H.W. 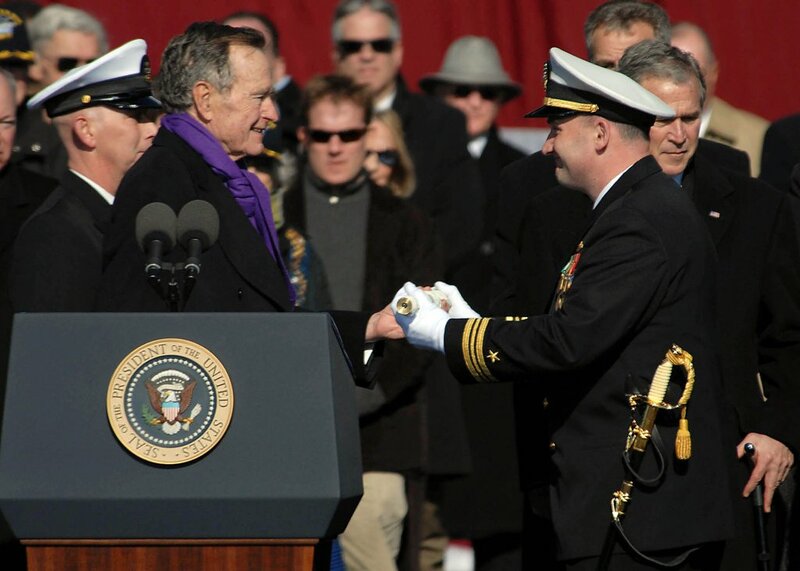 Bush during the ship's commissioning ceremony. U.S. Navy photo by Mass Communication Specialist 1st Class Demetrius Patton (#090110-N-5735P-073). 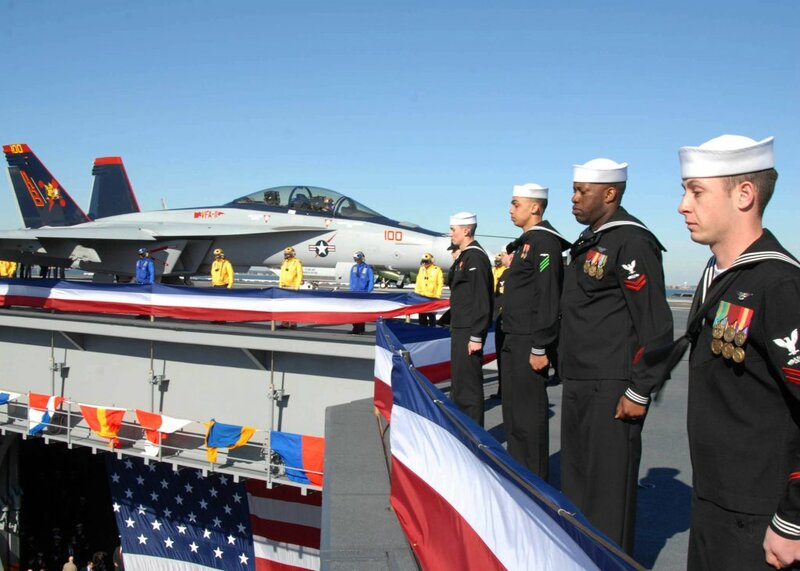 CAPT Kevin E. O'Flaherty, center, commanding officer of the aircraft carrier USS George H.W. 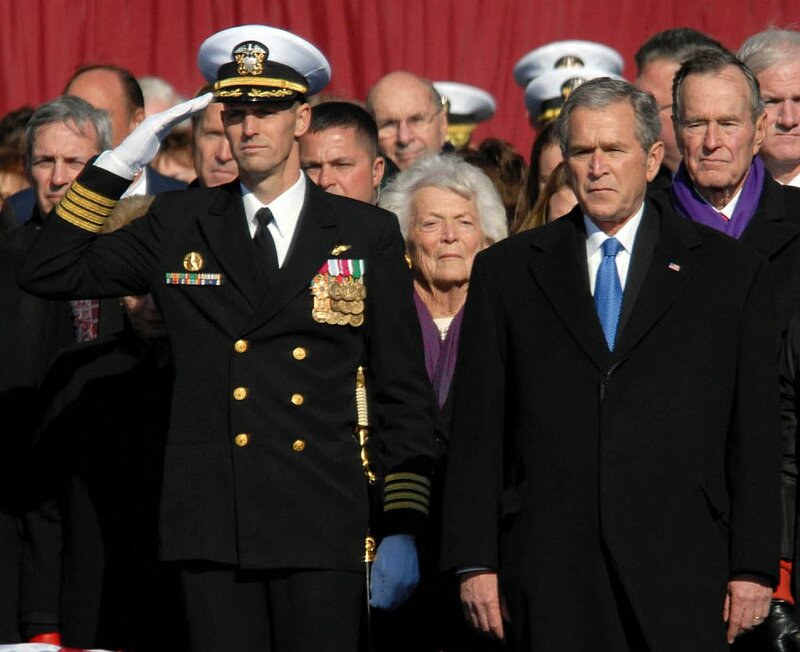 Bush (CVN-77), salutes during the ship's commissioning ceremony. President George W. Bush and first lady Laura Bush, left, attended the ceremony and former President George H.W. Bush, right, delivered the keynote address. U.S. Navy photo by Mass Communication Specialist 1st Class Demetrius Patton (#090110-N-5735P-080). 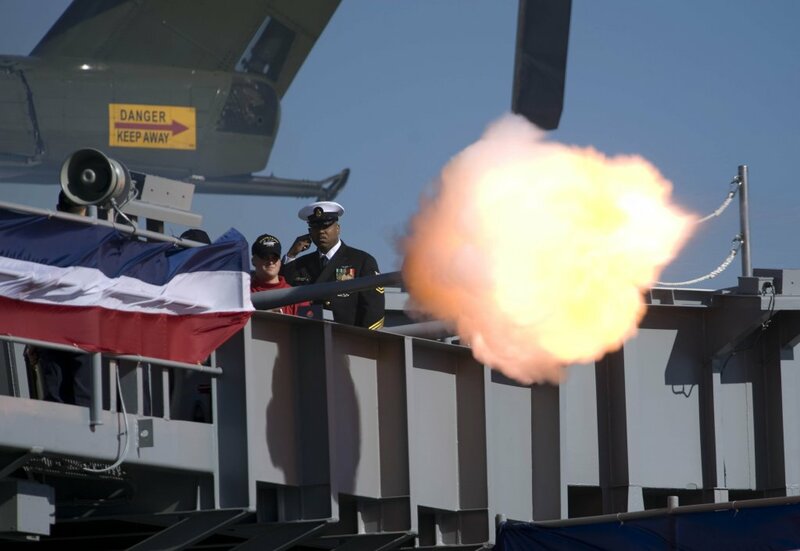 Sailors fire the saluting battery in honor of President George W. Bush. U.S. Navy photo by Mass Communication Specialist 1st Class Chad J. McNeeley (#090110-N-0696M-054). CAPT Kevin E. O'Flaherty, commanding officer of the aircraft carrier USS George H.W. 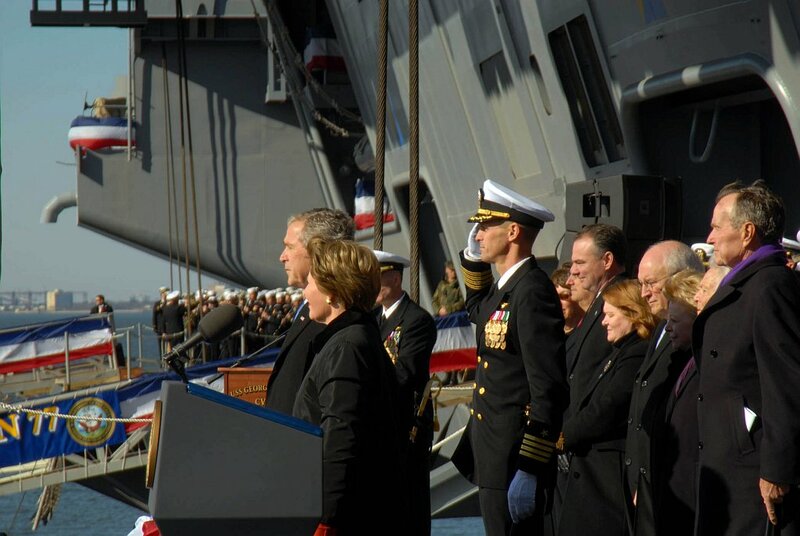 Bush (CVN-77) salutes during the national anthem with President George W. Bush and former President George H.W. Bush. U.S. Navy photo by Mass Communication Specialist 2nd Class Eric S. Garst (#090110-N-6125G-062). 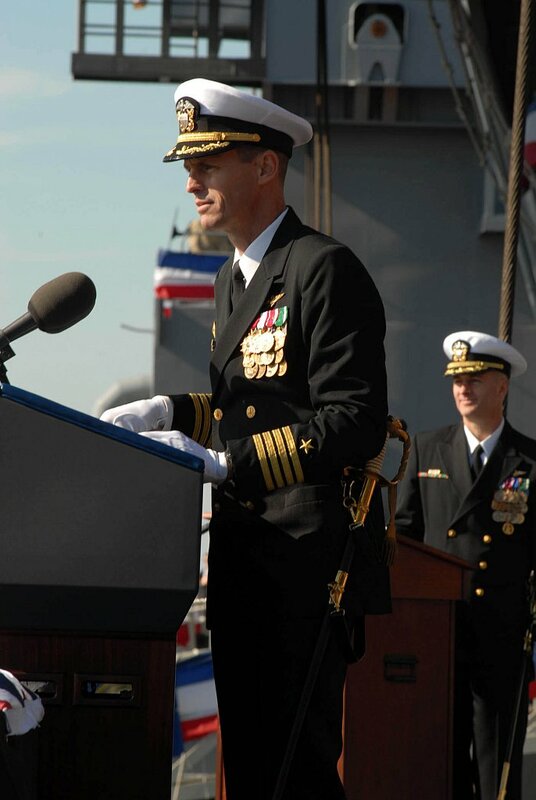 CAPT Kevin E. O'Flaherty, commanding officer of USS George H.W. 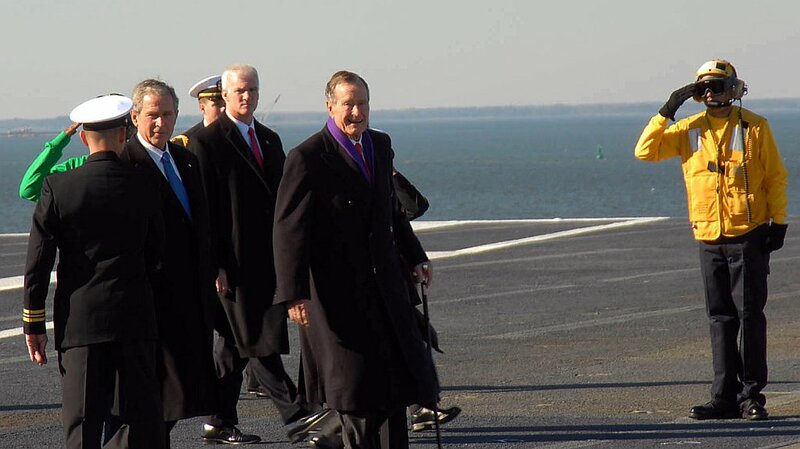 Bush (CVN-77) stands between President George W. Bush, right, and former President George H.W. 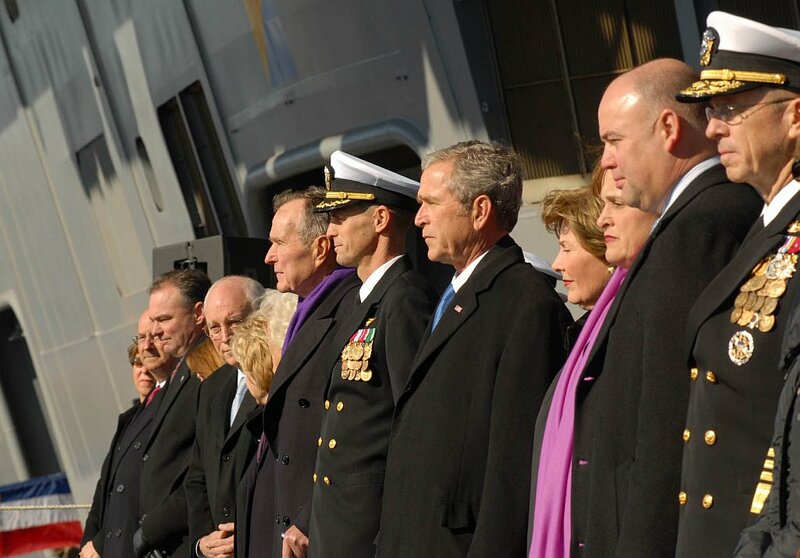 Bush as they stand with other dignitaries and their spouses during the commissioning ceremony for the aircraft carrier. U.S. Navy photo by Mass Communication Specialist 1st Class Demetrius Patton (#090110-N-5735P-092). 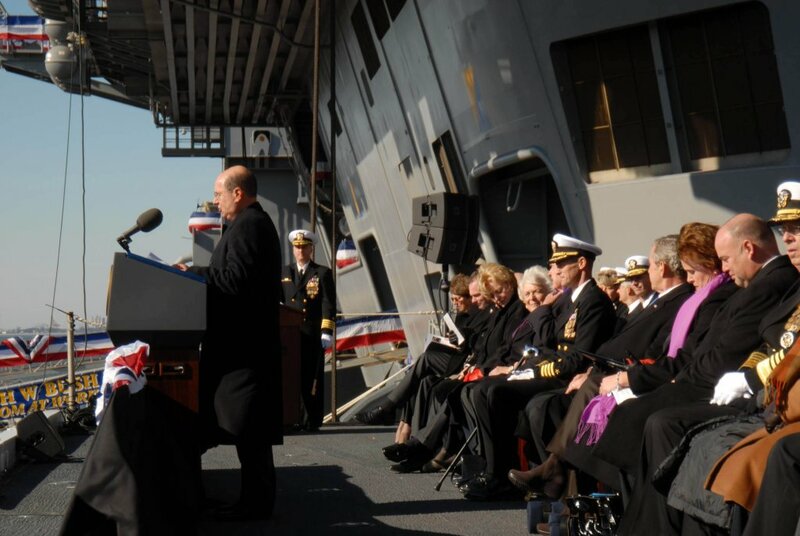 Secretary of the Navy Donald C. Winter addresses the audience at the commissioning ceremony of the Navy's newest nuclear-powered aircraft carrier USS George H.W. Bush (CVN-77) onboard Naval Station Norfolk. U.S. Navy photo by Mass Communication Specialist 1st Class Demetrius Patton (# 090110-N-5735P-159). Chief of Naval Operations (CNO) ADM Gary Roughead delivers remarks during the commissioning ceremony for the aircraft carrier USS George H. W. Bush (CVN-77) in Norfolk, Va. U.S. Navy photo by Mass Communication Specialist 1st Class Tiffini M. Jones (#090110-N-8273J-045). 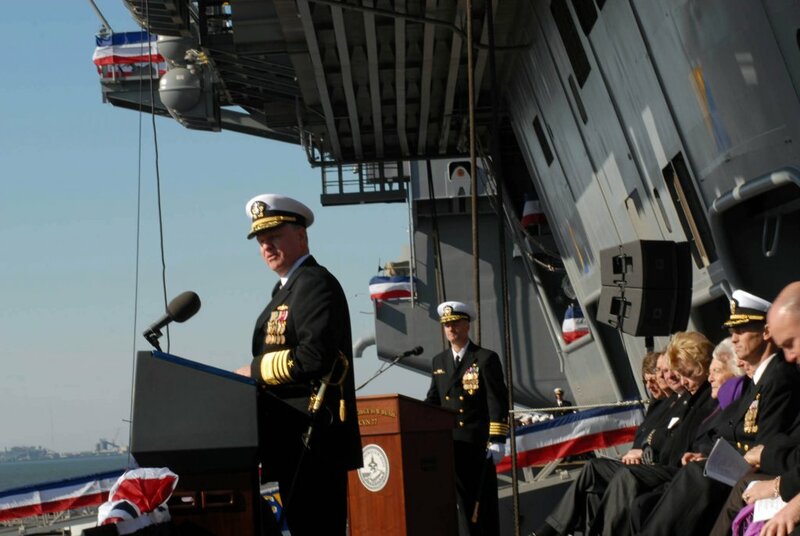 Chief of Naval Operations ADM Gary Roughead addresses the audience attending the commissioning ceremony of the Navy's newest nuclear-powered aircraft carrier USS George H.W. Bush (CVN-77) onboard Naval Station Norfolk. U.S. Navy photo by Mass Communication Specialist 1st Class Demetrius Patton (# 090110-N-5735P-179). 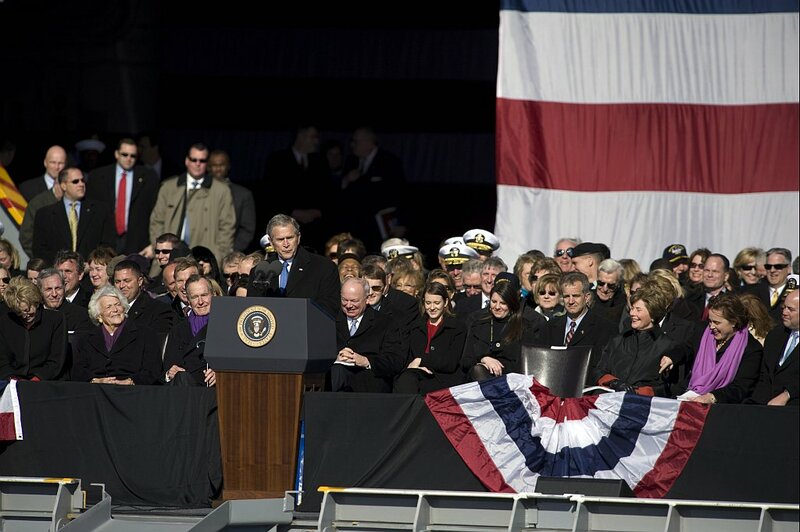 President George W. Bush addresses the audience at the commissioning ceremony for the aircraft carrier USS George H.W. Bush (CVN-77). U.S. Navy photo by Mass Communication Specialist 1st Class Chad J. McNeeley (#090110-N-0696M-091). 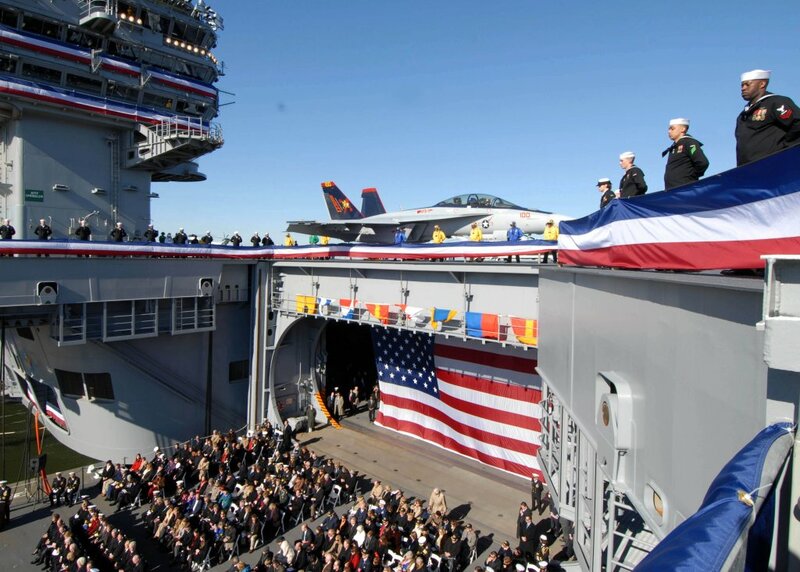 Ship's sponsor Dorothy Bush Koch, her husband Bobby; U.S. Navy ADM Mike Mullen, chairman of the Joint Chiefs of Staff and his wife Deborah; Ellen Roughead and Chief of Naval Operations, ADM Gary Roughead, attend the commissioning ceremony for the aircraft carrier USS George H.W. 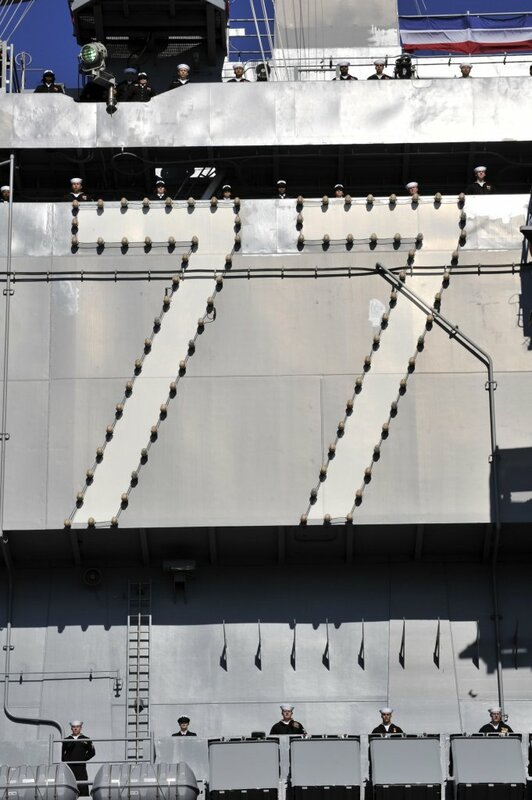 Bush (CVN 77). U.S. Navy photo by Mass Communication Specialist 1st Class Chad J. McNeeley (#090110-N-0696M-096). 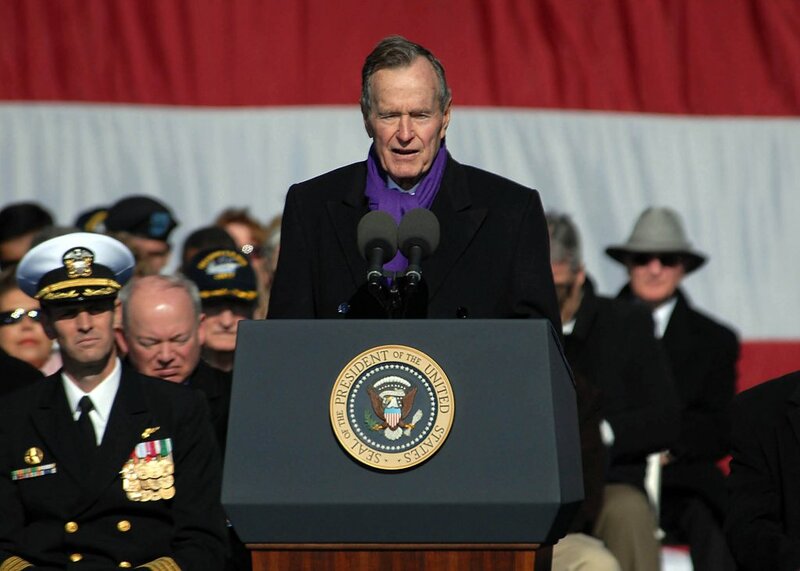 President of the United States George W. Bush speaks at the commissioning ceremony for the aircraft carier USS George H.W. Bush (CVN-77). Present at the ceremony are his parents, former first lady Barbara Bush and the ship's namesake, former President George H.W. Bush. U.S. Navy photo by Mass Communication Specialist Eric S. Garst (#090110-N-6125G-102). The audience gathers for the commissioning ceremony. U.S. Navy photo by Mass Communication Specialist 2nd Class Jennifer L. Jaqua (#090110-N-4669J-086). 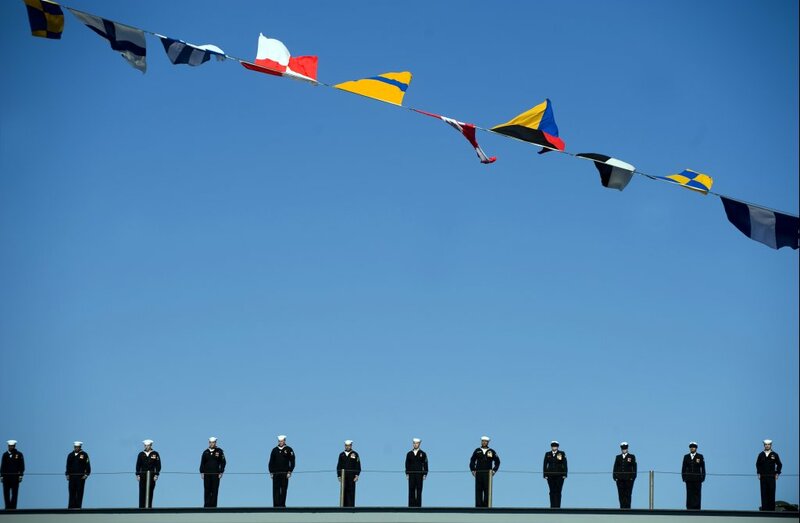 Sailors marching in formation in the coming alive ceremony during the commissioning of the aircraft carrier USS George H.W. Bush (CVN-77) take the first to manning the rails. The coming alive ceremony is a time-honored tradition where the crew takes up positions throughout the ship showing she is ready to go to sea. U.S. Navy photo by Mass Communication Specialist Seaman Joel S. Kolodziejczak (#090110-N-4543K-324). Crewmembers of the aircraft carrier USS George H.W. 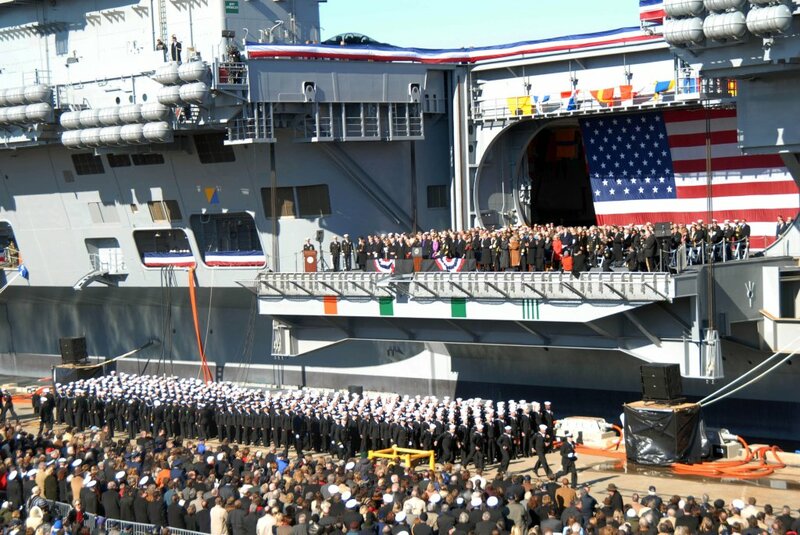 Bush (CVN-77) keep with the Navy tradition of running to man the rails for the first time to bring the ship to life. U.S. Navy photo by Mass Communication Specialist 1st Class Chad J. McNeeley (#090110-N-0696M-213). Sailors man the rails and bring the ship to life. U.S. Navy photo by Mass Communication Specialist 1st Class Chad J. McNeeley (#090110-N-0696M-222). Sailors man the rails and bring the ship to life. U.S. Navy photo by Mass Communication Specialist 1st Class Tiffini M. Jones (#090110-N-8273J-108). Sailors man the rails and bring the ship to life. U.S. Navy photo by Mass Communication Specialist 1st Class Chad J. McNeely (#090110-N-0696M-143). CAPT Kevin E. O'Flaherty, left, commanding officer of the aircraft carrier USS George H.W. 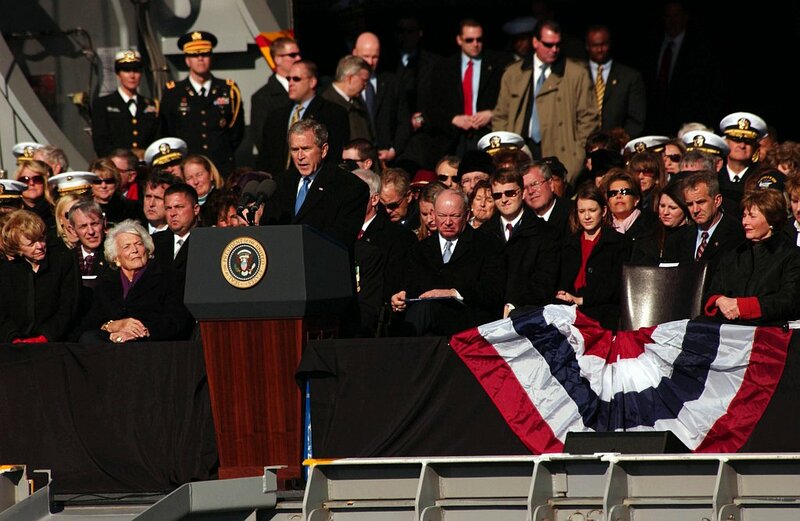 Bush (CVN-77), stands next to President George W. Bush during a 21-gun salute. U.S. Navy photo by Mass Communication Specialist 3rd Class Micah P. Blechner (#090110-N-0000X-156). 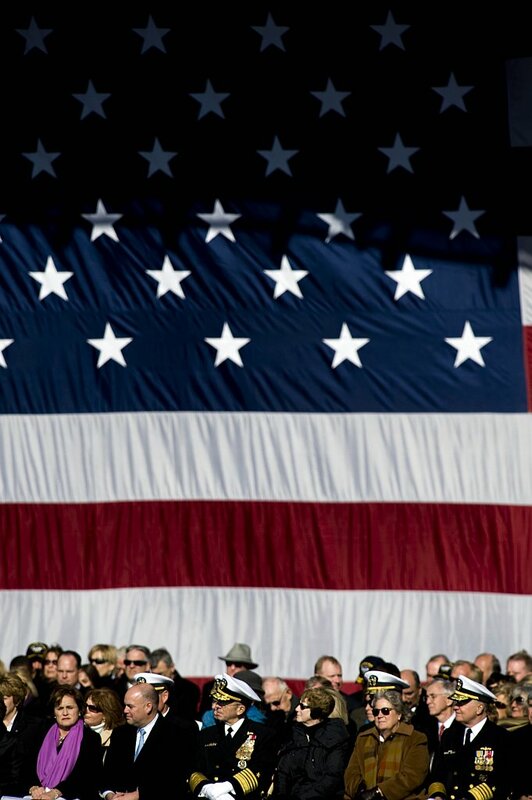 Audience members listen to remarks during the commissioning ceremony for the aircraft carrier USS George H.W. Bush (CVN-77). U.S. Navy photo by Mass Communication Specialist 2nd class Eric S. Garst (#090110-N-6125G-151). CAPT Kevin E. O'Flaherty delivers remarks during the commissioning ceremony. U.S. Navy photo by Mass Communication Specialist 1st Class Demetrius Patton (#090110-N-5735P-444). CAPT Kevin E. O'Flaherty, commanding officer of the aircraft carrier USS George H.W. 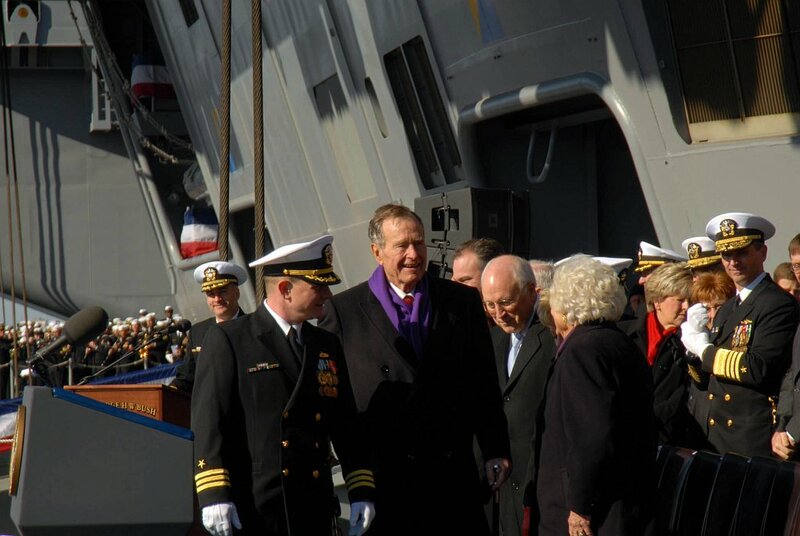 Bush (CVN-77), welcomes former President and ship's namesake George H.W. Bush to the commissioning ceremony. Bush delivered the keynote address at the ceremony. U.S. Navy photo by Mass Communication Specialist 3rd Class Micah P. Blechner (#090110-N-4408B-405). Former President George H.W. 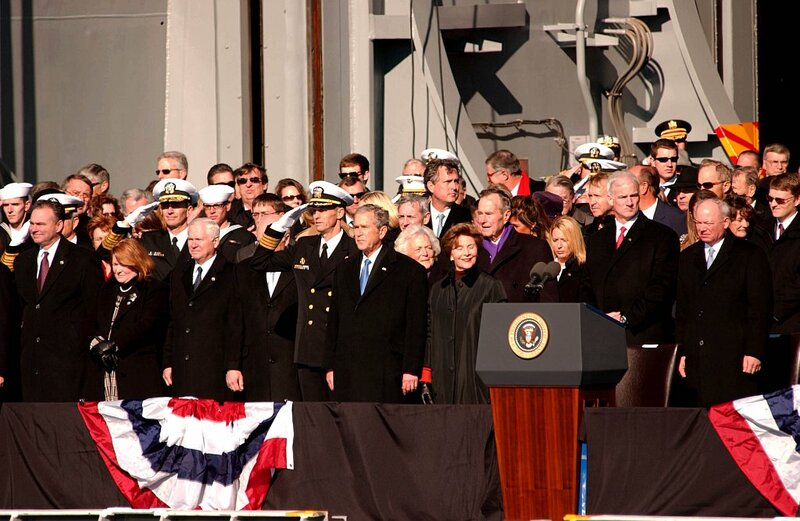 Bush delivers his remarks at the commissioning ceremony for the aircraft carrier USS George H.W. 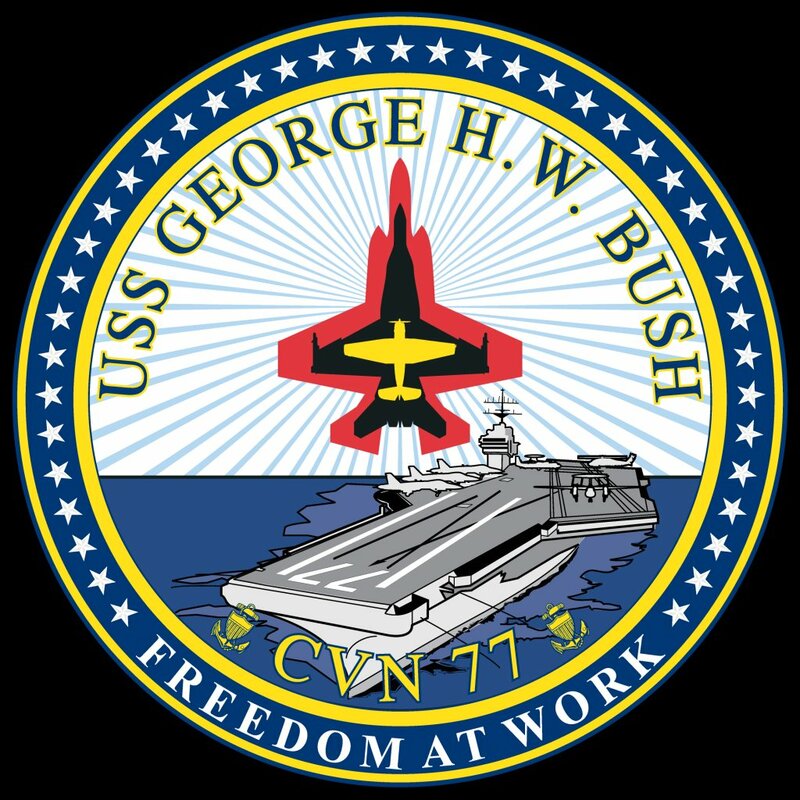 Bush (CVN-77). U.S. Navy photo by Mass Communication Specialist 3rd Class Micah P. Blechner (#090110-N-4408B-453). Command Master Chief Jon Port, from the Navy's newest aircraft carrier USS George H.W. 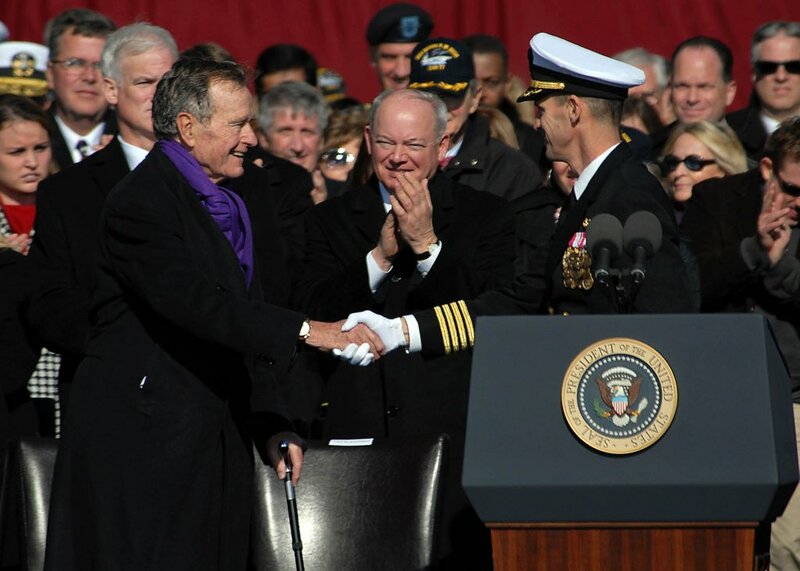 Bush (CVN-77), passes the "ceremonial long glass" to former President George H.W. 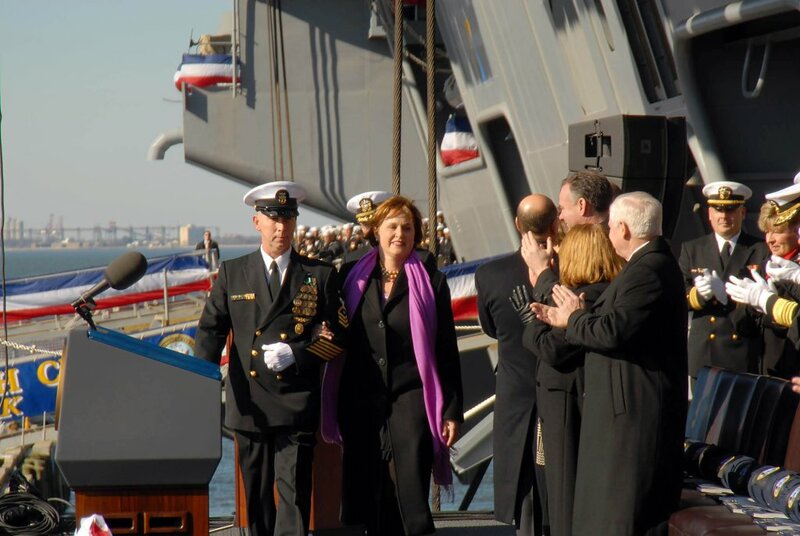 Bush, the ship's namesake, during her commissioning ceremony at Naval Station Norfolk. U.S. Navy photo by Mass Communication Specialist 1st Class Demetrius Patton (# 090110-N-5735P-239). LCDR George Brickhouse, assigned to the aircraft carrier USS George H.W. 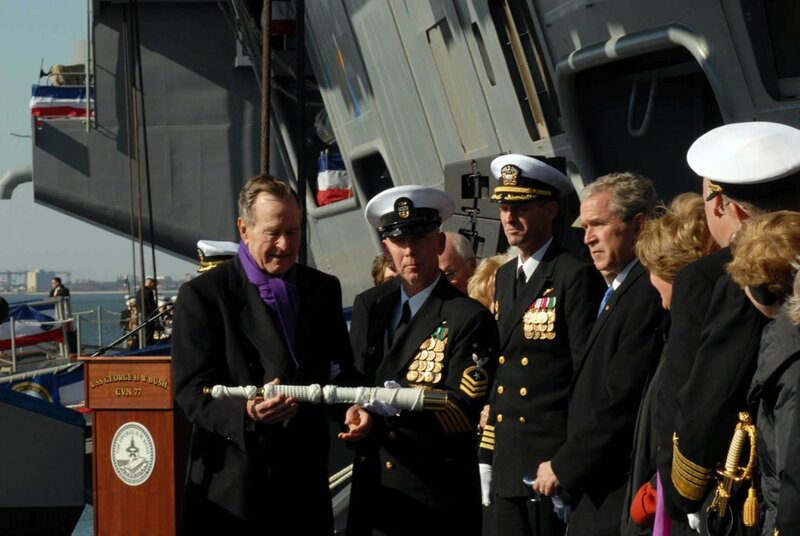 Bush (CVN-77) accepts a long glass symbolizing the setting of the first watch from former President and ship's namesake George H.W. Bush, during the ship's commissioning ceremony at Naval Station Norfolk, Va. U.S. Navy photo by Mass Communication Specialist 3rd Class Micah P. Blechner (#090110-N-4408B-477). F/A-18 Hornet aircraft assigned to Air Wing 1 at Naval Air Station Oceana, Va. perform a flyover during the commissioning ceremony for the aircraft carrier USS George H.W. 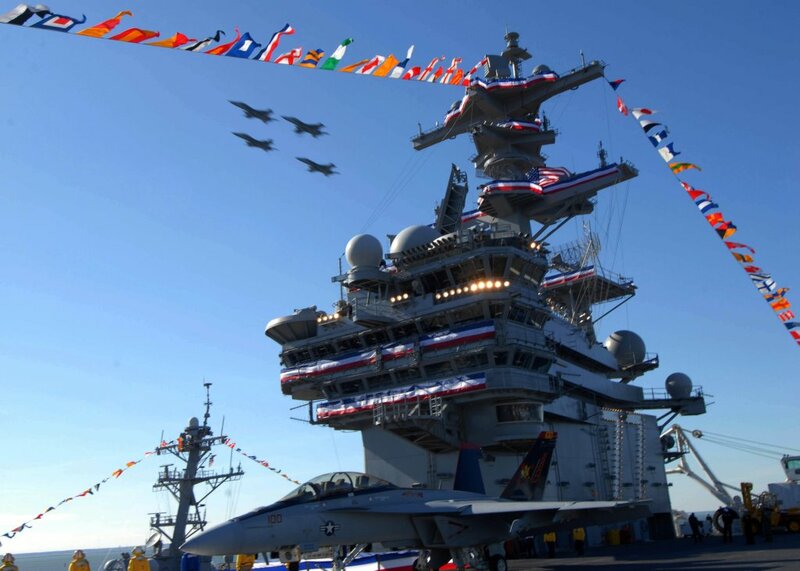 Bush (CVN-77). U.S. Navy photo by Mass Communication Specialist 1st Class Susan Caraballo (#090110-N-8544C-066). 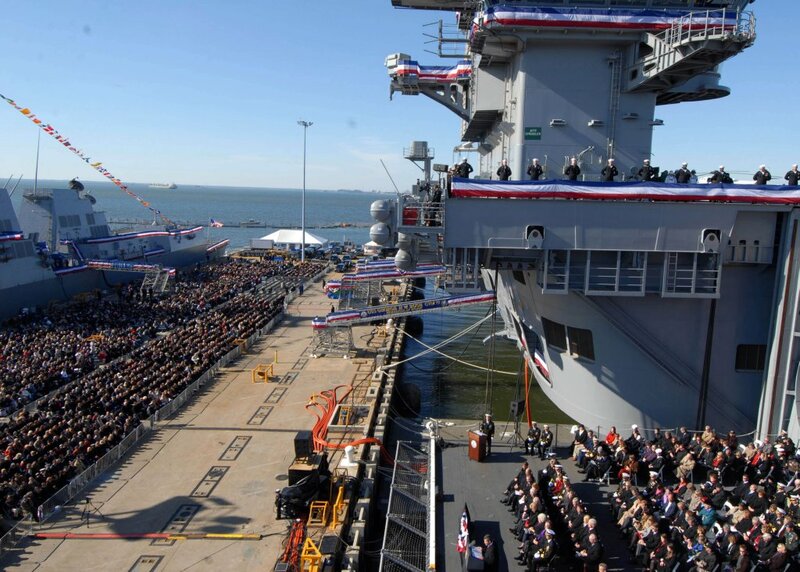 Sailors position themselves to "bring the ship alive" during the commissioning ceremony of the Navy's newest nuclear-powered aircraft carrier USS George H.W. 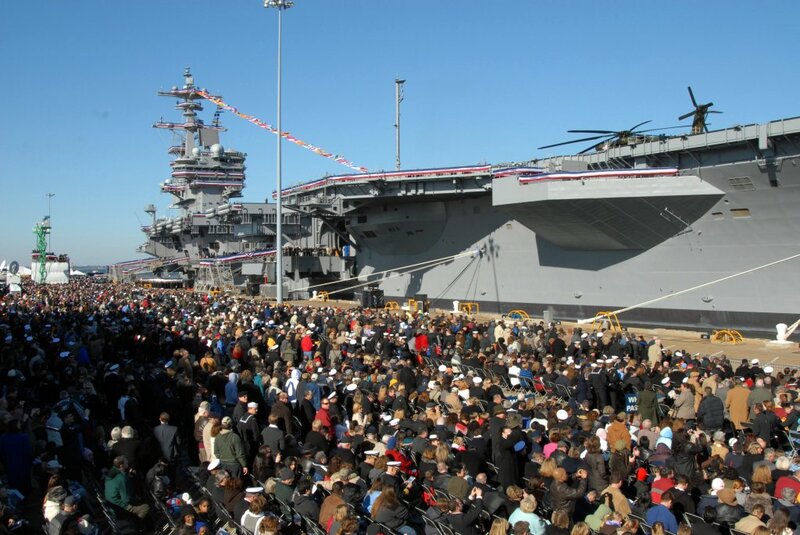 Bush (CVN-77) at Naval Station Norfolk. U.S. Navy photo by Mass Communication Specialist 1st Class Demetrius Patton (# 090110-N-5735P-300). 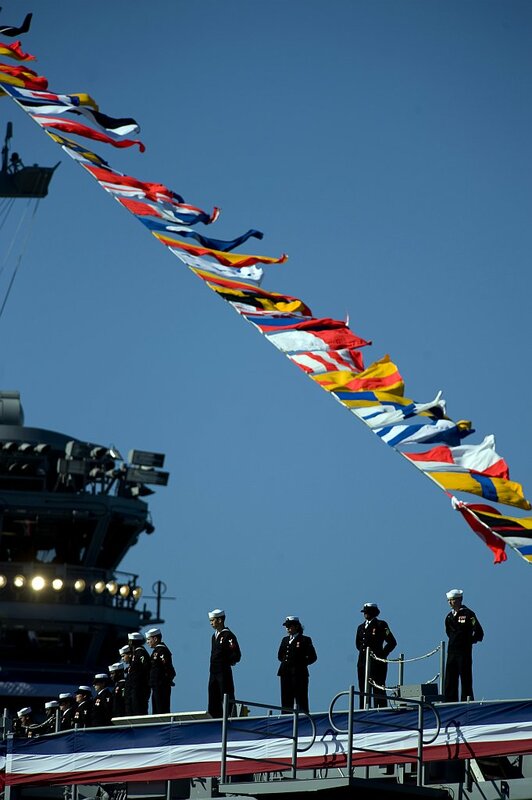 Sailors assigned to the aircraft carrier USS George H.W. Bush (CVN-77) man the rails during the ship's commissioning ceremony. U.S. Navy photo by Mass Communication Specialist 1st Class Susan Caraballo (#090110-N-8544C-070). Sailors assigned to the aircraft carrier USS George H.W. Bush (CVN-77) man the rails during the ship's commissioning ceremony. U.S. Navy photo by Mass Communication Specialist 1st Class Susan Caraballo (#090110-N-8544C-088). 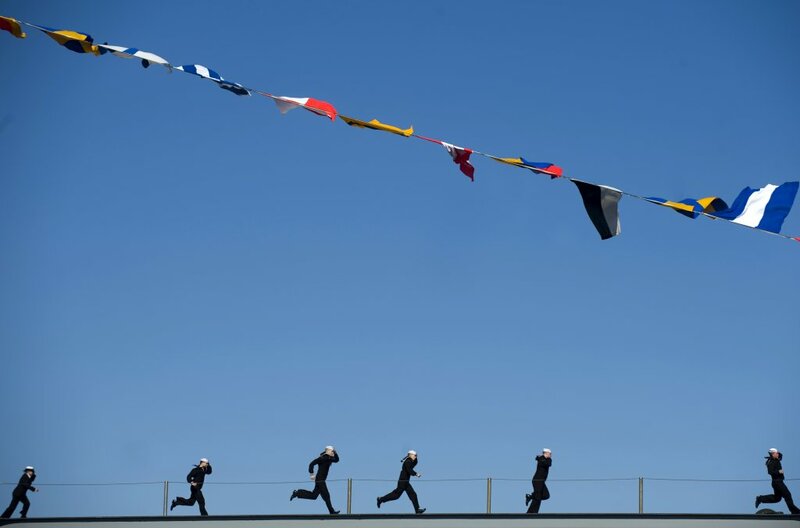 Sailors assigned to the aircraft carrier USS George H.W. Bush (CVN-77) man the rails during the ship's commissioning ceremony. U.S. Navy photo by Mass Communication Specialist 1st Class Susan Caraballo (#090110-N-8544C-099).